Modern methods, traditional values. Developing concrete skills for the concrete jungle in a hands on, interactive environment focused on developing the individual's best qualities as the WSLVT system works for them. What is the focus of our training? Function, NOT Fashion. We train to make our skills to be Simple, Direct, and Efficient. Belts, sashes, and uniforms do not win the fight. A solid practice of the System, Science, and Skills give you the individual what you need to work best for you putting the power in your hands. The "Young Idea Form" is the blueprint and most important form of the system containing its fundamental Concepts, Structures, and Actions. Developing essential elements such as the Yee Ji Kim Yeung Ma (Stance), Centreline Theory, Chiu Ying (Facing), and Lat Sau Jik Chung (Springy Forward Elbow Intention) which is a behavioural concept action unique to WSLVT. It is the roots from which the practitioner's understanding, practice, and skills will grow from. This Second "Bridge Seeking" Form gives the structures and actions of the first form life. It is an introduction to essential Footwork such as Juen Ma (Shifting) and Seung Ma (Forward Moving Stance) as well as the concept of Djoi Ying (Chasing Centre). Combat is alive and dynamic. Your opponent will not be a complient drill partner who will execute predictable robotic attacks. Chum Kiu provides the tools and concepts to be diverse, in adverse situations, with Control and Balance. The form also provides the resources to building a key training method in Ving Tsun, Chi Sau. In combat, mistakes will be made and situations will arise that will compromise your ability to apply yourself dynamically. That's the reality of fighting and combat. There are no rules in the concrete ring and the system's Third Form breaks some of the fundamental rules of the system to help us recover from extreme situations. Containing structures, actions, and concepts from all three open-hand forms, it is an essential tool for honing those structures, angles, distance, timing, energy, and overall coordination. The wooden dummy gives you the ability to train Ving Tsun actions with a training partner that doesn't mind the physical contact and will give you the feedback information to take your skills to a higher level of application. 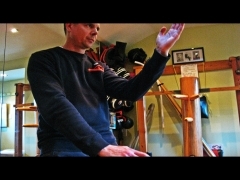 The empty hand forms and wooden dummy training are taken to the next level of Control, Balance, and Coordination through the practice of the Ving Tsun Gwun (Pole). It develops an incredible connection and cultivation of 'Ground Power' through a solid stance base practiced through the Che Gwun Kuen exercise. The Pole Form and its drills develop the unified application of the legs, body, and arms as ONE explosive and powerful action. 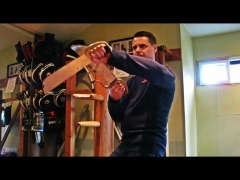 The second of the two Ving Tsun weapons and traditionally the last element of training introduced to the practitioner. A high skill level of understanding, application, and control of the open hand forms, chi sau, wooden dummy, and boxing applications are needed to reach this level. The concepts and angles of the Ving Tsun Do are unique to themselves and in some ways conflict with the fundamental concepts of the system. An exciting reward to an exciting journey of training. As part of S3VT's training we reinforce the system's qualities with a dynamic training regimen which includes Focus Pads, VT Boxing, and Sparring to develop the skills necessary for the results necessary. The ability to execute punches of quality, not quantity. To be able to hit your target with control and force. To finish the your opponent decisively and efficiently. At the end of the day, it all comes down to having quality strikes. The forms, drills, dummy, and weapons are all tools to developing efficient attributes that get the job done. Chi Sau is unique to Ving Tsun that trains develops natural reflex responses for an when engaging in close range combat ranges. It is NOT fighting but a means of developing attributes that compliment fighting skills. It teaches us to practice the concept of "Djoi Ying, Mok Djoi Sau" (Always Chasing Centre, Never Chasing Hands) as well as the unconscious awareness to create and respond to angles and lines of force that allow you to counter attack your opponent without challenging their lines of force and attack. S3VT PRIVATE TRAINING S3SSIONS - Small Group and One On One Training times are available in limited time slots. Individually tailored WSLVT training sessions to build on and improve every level of experience, from Beginner to Advanced, through every Level and Section of the S3VT System Syllabus. Every S3ssion will be a hands on, interactive session designed to develop skills that the individual can understand, apply, and be effective with. For more info and inquiries, make contact with us. BODYPULSE : Creating a foundation that guides and supports the development of one's unique personal fitness goals for optimum wellbeing. Working together to build a personalized approach that encourages positive, ongoing lifestyle changes. Click for more info. FUZION BOOT CAMP : Sam Berardinelli has been active in sports and fitness since he was a child. He developed a passion for fitness throughout an athletic career in his youth and attended York University for Kinesiology and has graduated with Honours in 2009 obtaining his degree in Kinesiology and Health Sciences. He has also been certified as a Kinesiologist and has worked in rehabilitative therapy helping many patients back to health through customized exercise programs. Sam has also holds certification as a personal trainer with CPTN and has been training clients for well over a year now teaching boot camp classes, 2 on 1 training, and personal training with individuals. His approach is unique as he blends intense functional training programs with eastern philosophies such as meditation and yoga exercises. He also strongly believes in building a strong foundation with each one of his clients and incorporating positive encouragement to help clients achieve their goals. The goal is to help all of his clients develop a healthy lifestyle with essential nutrition to assist with their needs. He truly believes that fitness and health is a lifestyle and has been a prime example of that with his own healthy lifestyle choices. S3VT Members will have access to a sign-in forum where they can discuss relative S3VT System Syllabus content, training, training methods, questions, and exclusive content to take the training home and on the road. We're gonna be doing something special with this section of the website. Because there are some unique ideas in development it's going to take a little bit more tweaking, testing, and programming to make sure it's just right. The idea behind this FORUMS section will be to encourage an open dialogue of Concepts, Training Methods, and other Multi-Platform Media to bring together our immediate community and WSLVT pracititioners worldwide in a platform that all can contribute to and enjoy. Knowledge is power. And we're working to put that power in the palm of your hand. User driven, and practitioner inspired. The moment we go live, you'll know right away! Thanks for checking in.